The Scala has a so-called "tornado" line along the side that makes the vehicle look longer. Skoda is going upscale in Europe's compact car segment with the Scala hatchback, which will go on sale in the first half of next year. The Scala replaces the Rapid to slot below the brand's Octavia. Its safety and driver assistance equipment, and design, give the hatchback a much more upmarket position than the Rapid, which was sold as a budget model. Technology available will include radar-controlled adaptive cruise control and parent Volkswagen Group’s ‘virtual cockpit’ screen in place of dials. Updates to the car’s infotainment system and satellite navigation can be delivered over the air (OTA) via the built-in SIM card, which connects to the Internet. The Scala is the first Skoda to be built on the VW Group’s MQB A0 platform, which the Czech brand is now in charge of developing. The use of the platform enabled Skoda to incorporate the latest technology. “MQB allows new assistance systems which have so far only been available in higher vehicle segments,” said Skoda’s head of technical development, Christian Strube. The Scala is the first Skoda to use a free-standing touchscreen in the center of the dashboard. The infotainment screens available range from 6.5 inches to 9.2 inches. Other technology includes standard LED headlights and taillights, an optional heated windscreen and an optional electric tailgate. Safety equipment includes standard automatic emergency ‘city’ braking and an advanced version of blind spot detection that Skoda calls Side Assist to spot overtaking cars up to 70 meters away. A sports chassis will also be offered with adaptive dampers that let the driver switch between Normal or Sport modes. The Scala is 4363mm long, which is over 100mm longer than a VW Golf. 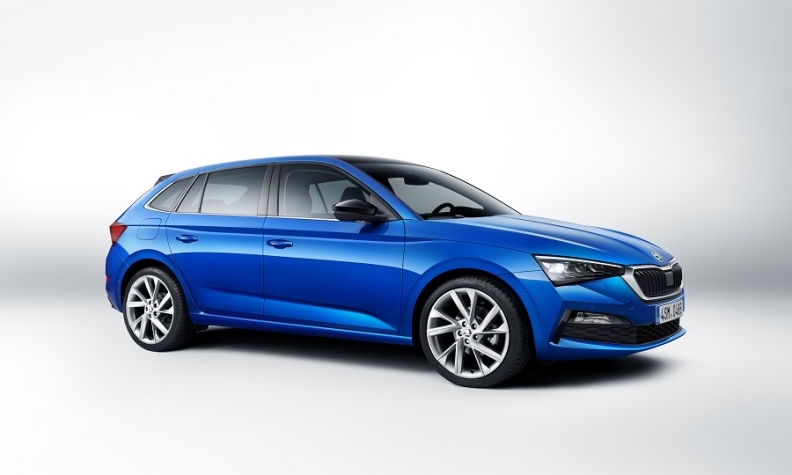 The long wheelbase and extended rear overhang give the Scala a cabin almost as big as the larger Octavia, Skoda said. 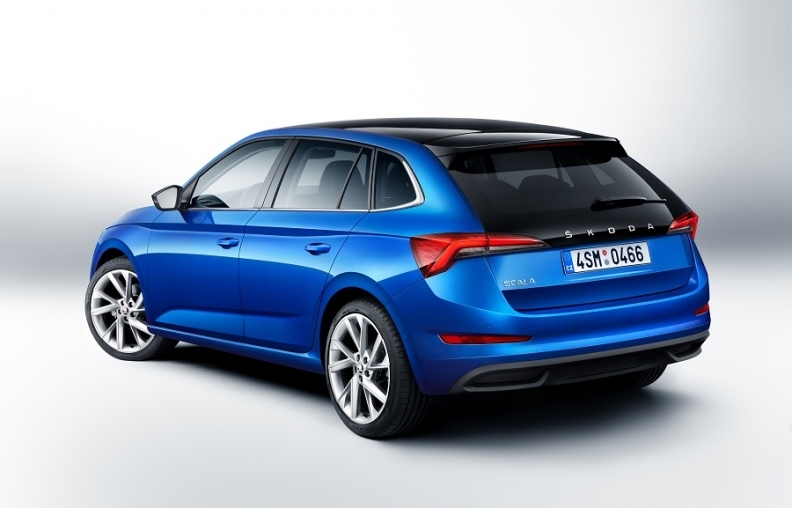 The Scala’s trunk capacity at 467 liters with the rear seats up is the largest in the car’s class, Skoda said. The Scala is the first Skoda production vehicle in Europe with block lettering across its tailgate. The engine range at launch will be one diesel and three gasoline engines. The most powerful engine is a 1.5-liter turbocharged gasoline unit with 148hp. A 1.0-liter three-cylinder turbocharged gasoline engine will be available in two power outputs. The 113-hp,1.6-liter TDI diesel has a selective catalytic reduction (SCR) filter and a particulate filter to reduce emissions. A CNG-powered version of the 1.0-liter engine badged G-Tec will be available later in 2019. The Scala was previewed by the Vision RS model at the Paris auto show in October that had a plug-in hybrid drivetrain based on the 1.5-liter gasoline engine. No production model was announced but Skoda is expected to launch a performance-oriented plug-in hybrid later in the car’s cycle. A plug-in hybrid version of the Superb using the same drivetrain will be launched in 2019, Skoda has said. The Scala has a central touchscreen positioned high on the dashboard. It also has an upscale soft-foam surface.